Happy March! How is it March already? This year is going by so fast and I'm still crossing out 2015 and replacing it with 2016, oops! I'm excited to share some of my favorite travel hacks that I do religiously. Enjoy! Piggy Bank - This may not sound like a hack but if you do it right, it kind of is. Every time I had change, I would put half of it in my piggy bank and half in my parking coin purse (<-- #LALife). After only 6 months, I emptied the piggy bank to find $402.31! Cha-ching! I purchased a flight to Chicago and even had some leftover to partially cover hotel costs! iPhone Tripod - I don't know why it took me so long to purchase a tripod for my phone. As someone that uses their iPhone as the primary photography device, it's extremely handy. The one I have twists to conform to whatever platform and has a remote. It works perfectly especially if you're traveling solo. You won't have to sacrifice a beautiful view by limiting yourself to a selfie or asking a stranger with no photography skills! This one is mine and love it! Press 'N' Seal - This true travel hack has changed my life. What you do is lay some of your longer, bound-to-tangle jewelry flat on a sheet of Glad Press 'N' Seal. Then, you lay another sheet over it and press! You can fold them up after that into a compact size and you don't have to worry about them tangling! Genius? I think yes. External Charger - I can't count the times my phone unexpectedly died or I was rushing to find a somewhere to charge it. I also can't count the times my friends have borrowed my external charger once I wised up and bought one! Even if you think you're not going to need one, keep one with you. There are cute, compact and affordable external chargers out there that you're bound to love - like this one! Dryer Sheet - When I used to work for the airlines, a senior flight attendant told me this trick. You place a single dryer sheet in your suitcase. Yup, that's it! It keeps your clothes smelling fresh, especially on your way back from a trip! Night Moisturizer Inflight - Airports and airplanes are notorious for sucking your moisture dry so it's important to keep hydrated. Water? Yes but also your skin! I always use my night time moisturizer during a flight to keep my skin happy. Night moisturizers tend to be extra hydrating which is perfect for that dry, airplane skin. This is my go-to! Shower Cap - Shower caps are perfect for the shower sure, but they're multi-use when you want to wrap your shoes in your luggage! Keeps surrounding items clean of any dirt and you can usually grab them for free from your hotel! TSA Pre-Check - When someone asks me what my best investment has been, I always say TSA Pre-Check. Ok, maybe that's a little dramatic but so true! Paying $80 USD (for 7 years!) for it has saved me so much time and hassle. You don't have to take out your baggies, take off your shoes but most importantly, the Pre-Check lines so much shorter than the regular lines. If you live in the United States and thinking about investing, do it! Read more about TSA PreCheck on my new post! That's it for this round and I'll be sure to be back with more soon! I hope you enjoyed them and happy travels! None of the links are affiliated. Thank you Ankit for sending me the travel bank and external charger! 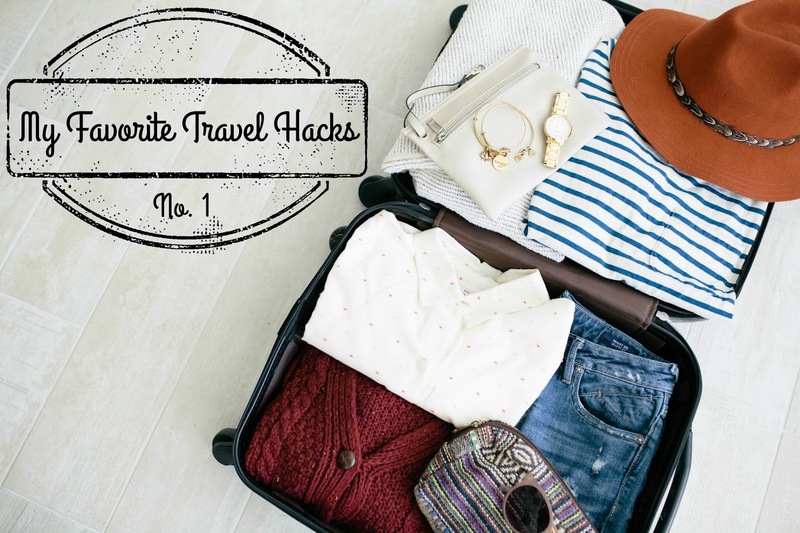 This was a great article with very reasonable and inexpensive travel hacks! Thank you! !